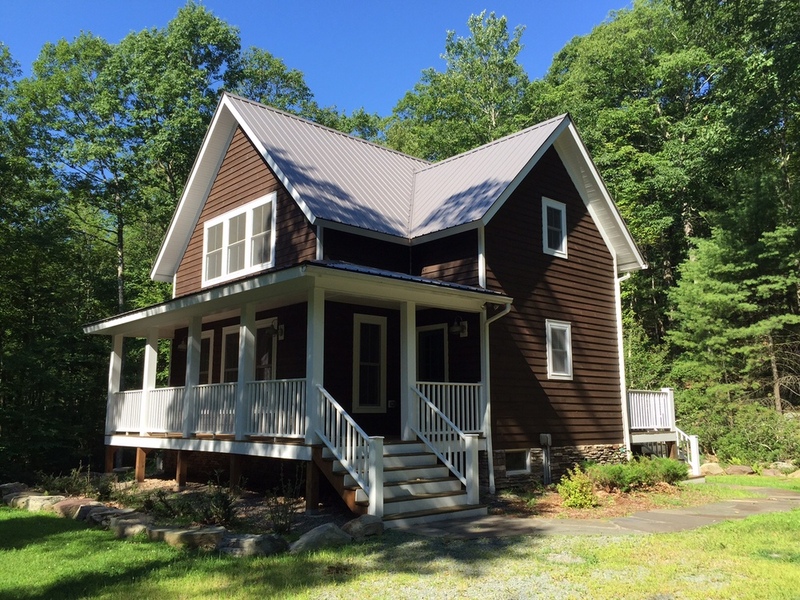 Bluestone Farmhouse (SOLD): 2 bd/ 2 ba in private 5-acre setting. Eldred, NY. 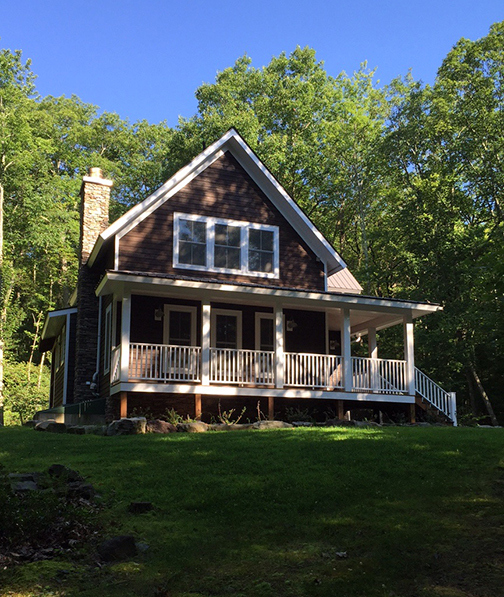 — Country House Realty: Fine Catskills and Upstate New York real estate, including Sullivan Co. and Ulster Co.
Bluestone Drive is a private road, developed with three distinct homesites. This 5-acre site is a peaceful and private setting, decorated by old growth forest, abundant ferns, mature shrubs and rock landscaping. One of the best features of the yard is its easy maintenance - perfect for a second home owner or vacation rental - the plants and trees are well established and carefully plotted to blend into the surrounding woods. There is ample yard, and plenty of room to clear for more. A pretty gravel drive leads up to the house, where up a short flight of stairs, you'll find the cutest door in Sullivan County! The knocker is a metal squirrel, and the door color is the perfect country shade of green. Best of all, once inside, you find that it's a Dutch door, with a clever latch to open just the top to catch the breeze, or greet a delivery person. Creative director. Clothing company....all starting to make sense. 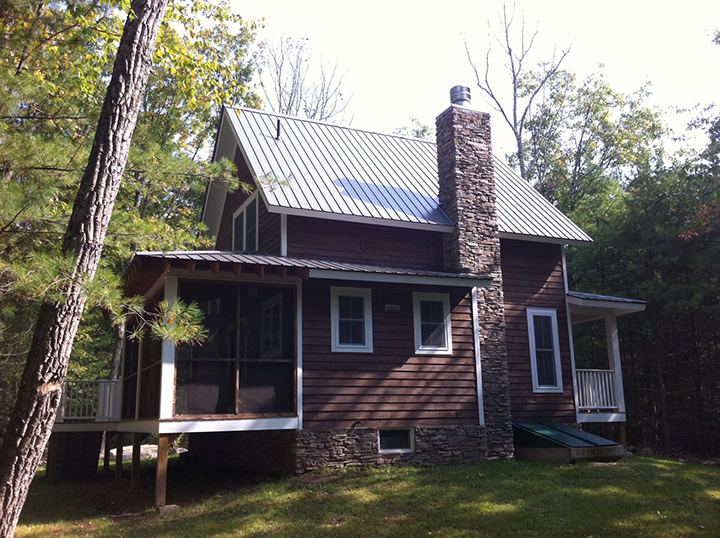 Outside, the color palette is dark brown wood siding, white trim, stone foundation and soaring chimney, and that sweet green door. Inside, the palette shifts to gray and white walls, dark brown wood and bluestone floors, white tile in the kitchen and bath, and dark steel lighting throughout - all accentuated by a beautifully crafted stone fireplace, angled into the corner of the living room and also visible when seated at the dining table. Enter that cute door and you're standing on a custom bluestone floor that flows from the foyer and its huge barn-door closet over to the downstairs bathroom. 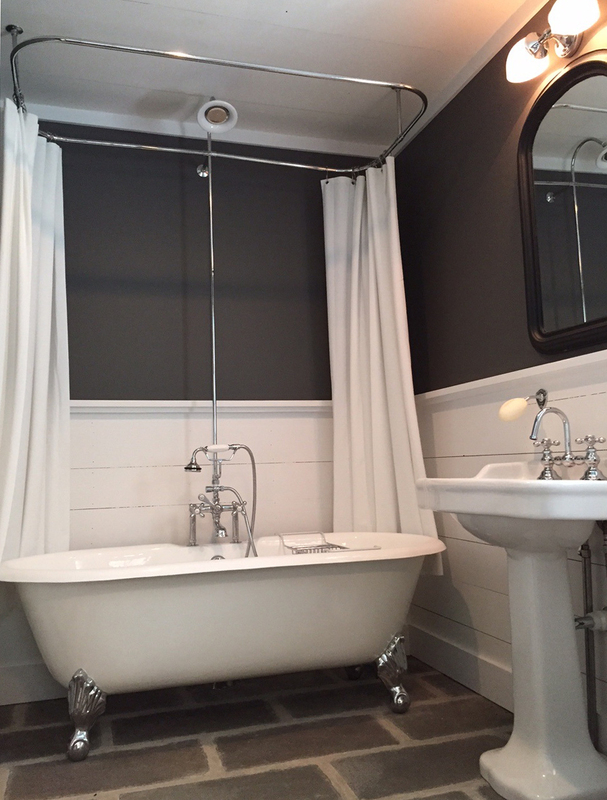 A luxurious size, with a window and a claw foot tub, this bathroom is dressed in dark gray and crisp white walls, perfectly balanced by the matte oversized bluestone floor tiles and chalky white grout. 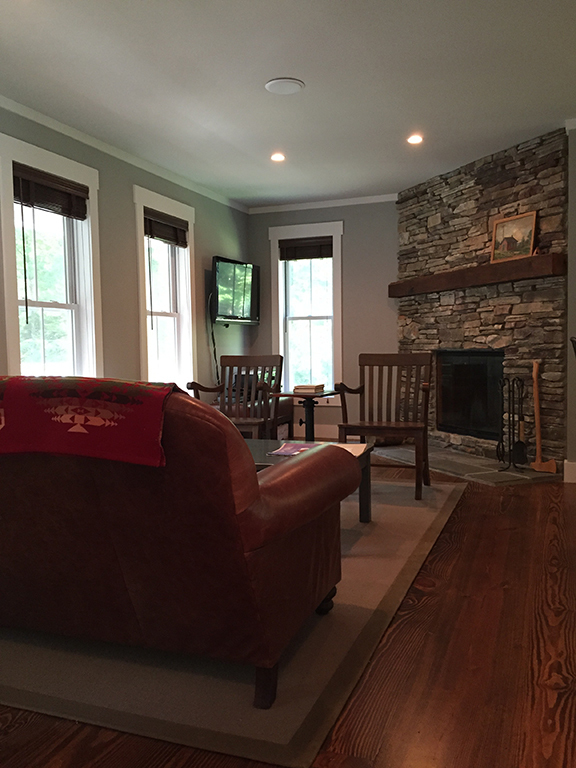 Further in, the main room is an open floorplan, with the gorgeous stone fireplace that fills a floor to ceiling corner wall. The living and dining area are separated by the suggested lines of the house, with no walls between. Ample windows on all sides of the house guarantee plenty of woodland sightings. A good-sized chef's kitchen occupies the rest of the first floor. The appliances are first rate: Liebherr counter-depth refrigerator, Fisher-Paykel two-drawer dishwasher and a Wolf 4-burner gas stove. 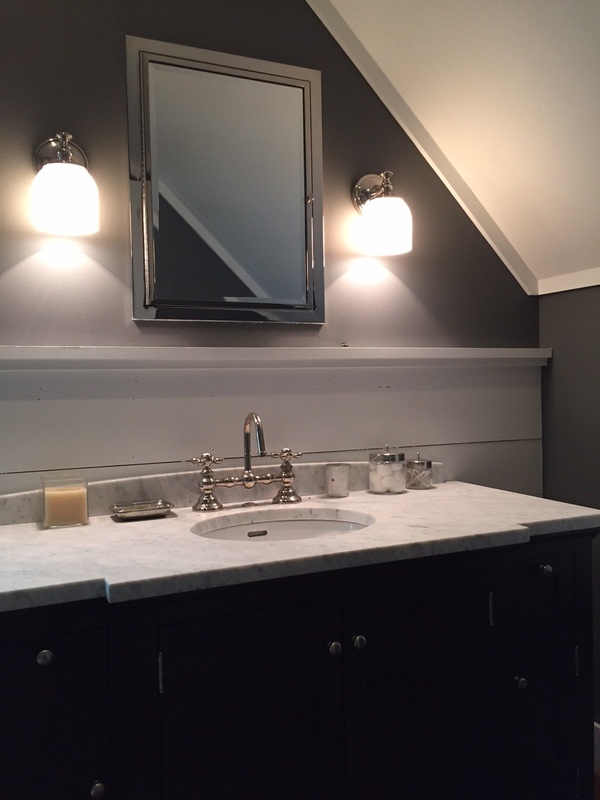 Subway tiles and wide-plank white-painted wood echo design elements used in both bathrooms. Straight past the dining room and through the French doors at the back of the house is one of the seller's favorite add-ons during the build - a large screened porch, currently set with a farm table, but could easily be converted into a seasonal sleep spot. The porch opens onto a smaller, outdoor deck, just before a set of stairs that descend into the back yard that leads gently uphill into the woods. Upstairs are two large bedrooms. The master slightly larger than the second, but visually quite a bit larger as the attic was traded for soaring cathedral height ceilings. 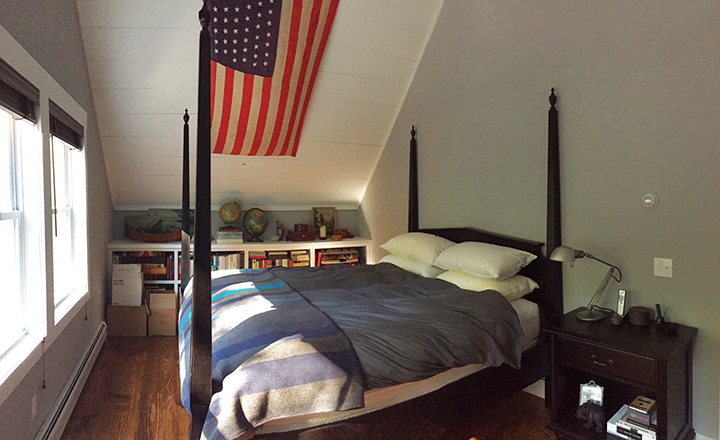 Both rooms feature sweet woodland views and massive closets. The master has built-in bookshelves that line the far wall. The third room upstairs is a dreamy bathroom that features an oversized fully tiled shower, with a built-in bench and TWO vibrant rain shower heads. It's understandable why the owner sacrificed the tub to the downstairs bathroom once you see this shower! Look up and you'll see one of the many built-in speakers hooked up to a stereo downstairs. Even the back porch has mounted speakers. Also worth mentioning is the unfinished but orderly English basement. Fully insulated and dry as a bone, the poured concrete walls and floors are primed for a transition into a third floor of living space.